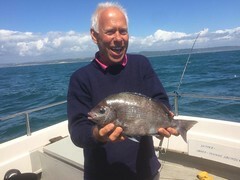 Picture of Lewis with a season's best Black Bream of 1,601gms (3lbs 8ozs) caught on his boat Pegasus which gave him a 100.76% specimen fish. 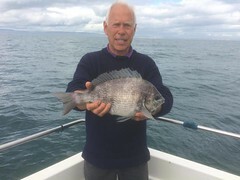 Colin with a very nice Black Bream caught on Pegasus (skipper Lewis Hodder) during a very wet day at the end of July. 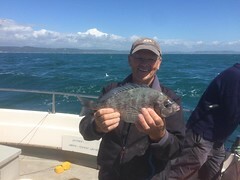 Mike with a 3lb Black Bream caught on Pegasus (skipper Lewis Hodder) in one of the wettest days anyone can remember fishing. 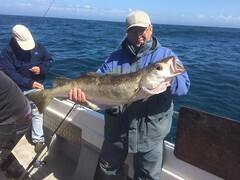 It rained for seven hours of the eight hour trip! 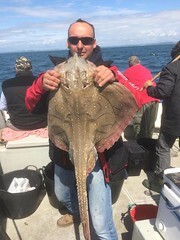 Picture of the best fish caught on the second day of this year's Five Go Fishing In Dorset Open Competition. 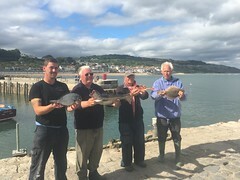 From Left to right Ash Legg - Best Bream 1,081gms, Roy Shipway - Best Pollack 2,490gms, Barry Moore - Best Red Gurnard 348gms, Mike Hansell - Best Plaice 850gms.